Should I Clean My Silver Coins? As solid silver bars, rounds and coins age, they may tarnish. Tarnish does not affect the metal content of your silver product, but it can have a modest impact on the resale value. Dealers and other buyers will often pay a bit less if the silver does not have its original luster. So older US coins for sale sell for less, but still give you the same amount of silver as new ones. 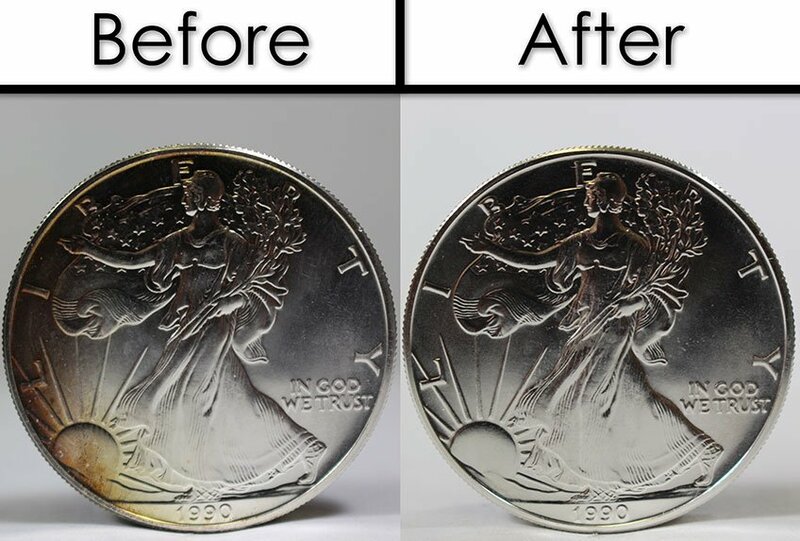 This simple method of cleaning silver coin collections with a small list of supplies can brighten up almost any tarnished silver. Not all tarnish can be removed, but this technique often works wonders. This can be something as simple as a cooking pan or a plastic container. There may be some residue left from the tarnished silver so don't use anything that shouldn't get dirty. The reaction of the warm water, baking soda and aluminum foil will allow the tarnished silver to clean beautifully. The warmer the water the better, but waiting for boiling water to cool down before scrubbing the silver can be time consuming. Microwaving 2 cups of water for 2-3 minutes should suffice and avoid boiling water. Any aluminum foil will do, what you have laying around in your kitchen will work great. The aluminum foil is key to the reaction which removes the tarnish. This process can get a bit messy. Drying the silver when finished will help to remove any water or baking soda residue. Avoid using old baking soda, a new container of baking soda is worth the minor expense to help clean up unsightly silver. These are great to help scrub silver. They are less abrasive than most other options and do a great job of protecting your hands. 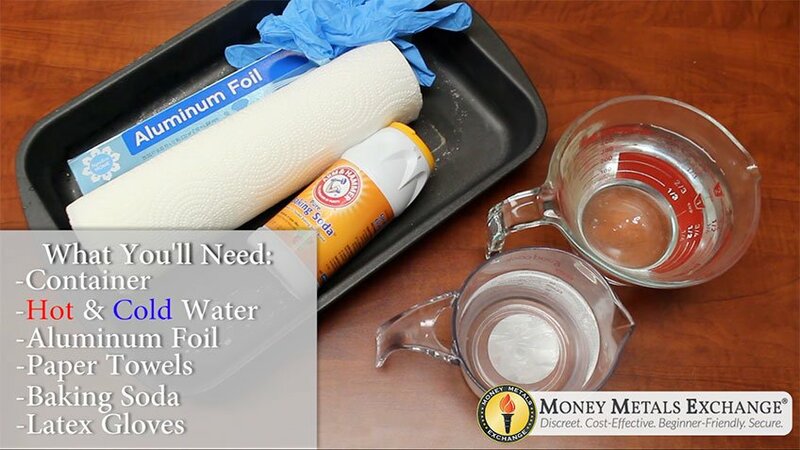 Line the entire container with aluminum foil. Ensure that the container is completely lined with as few gaps as possible, multiple layers may be necessary. Sprinkle baking soda inside the container on top of the aluminum foil. Line the bottom of the container with baking soda so that you can barely see the aluminum foil on the bottom of the pan. Add the tarnished silver into the middle of the container with the most tarnished side up. You may need to repeat steps if both sides are equally tarnished. Cover the silver with baking soda, enough to totally obscure the silver. Fill the container with hot water until the silver is completely covered. After the water has been poured in, add more baking soda on top of the silver. This will need to soak for at least 5 minutes. Soak times may vary depending on the amount of tarnishing. Put on the latex gloves and begin to lightly scrub the tarnished silver with the baking soda and water mixture. Be careful to not scrub the silver too hard - scratching can occur. Thoroughly scrub all sides, including the edges, to remove as much tarnish as possible. Rinse the silver frequently to see any remaining tarnish and re-apply baking soda to those areas. Rinse the silver off in the cold water, this step will help to remove any baking soda residue. Oftentimes, if this step is skipped, small white spots can remain on the silver as dried baking soda. Inspect the silver for any remaining tarnishing or left-over baking soda residue. Repeat steps 3 through 6 if necessary. Enjoy your like-new silver! 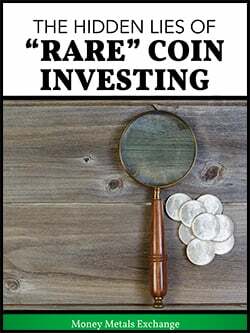 Are you interested in investing in silver coins? Listed below are some of the best choices for silver coins as an investment. Money Metals Exchange offers silver coins at highly competitive prices. In addition to the coins listed above, you can invest in a wide variety of coins from a reputable dealer online, without having to visit your local coin shop, and have them delivered directly to your door with reliable and fast shipping! Dan Novak is an avid survivalist and precious metals specialist at Money Metals Exchange. He works passionately to educate readers and customers on how to become more self reliant in our increasingly tumultuous economy.